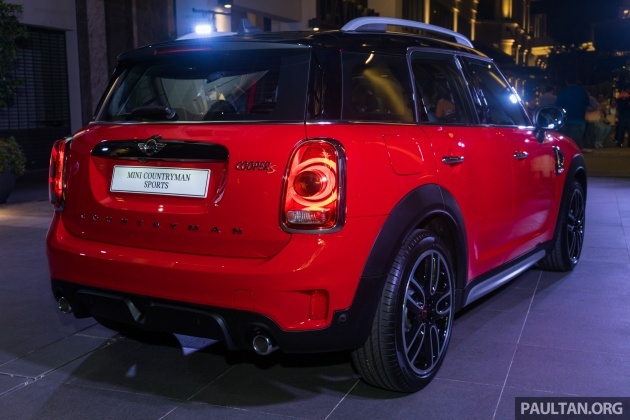 Aside from the MINI Cooper S E Countryman plug-in hybrid, BMW Group Malaysia has also introduced the Cooper S Countryman Sports today. Coming with a range of John Cooper Works accessories, it marks the debut of the locally-assembled (CKD) model alongside its petrol-electric sibling, bringing with it a lower price. 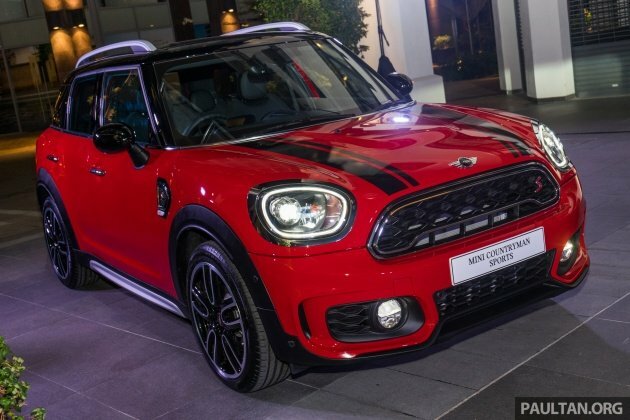 Retailing at RM245,888 on-the-road without insurance, the Sports is RM24,000 cheaper than the fully-imported (CBU) Cooper S that was introduced last year, and RM10,000 less expensive than the Cooper S E. Included in the price is a four-year, unlimited-mileage warranty with free scheduled service. On the outside, the Sports is equipped with the John Cooper Works Aerodynamic Kit that adds a more aggressive front bumper with integrated brake ducts, a rear diffuser and a tailgate spoiler. Finishing the look are 19-inch JCW Course Spoke alloy wheels with run-flat tyres. Inside, the Sports is embellished with anthracite headlining, stainless steel pedals and JCW door sill finishers, and its infotainment system has been upgraded to the full Professional navigation system with an 8.8-inch touchscreen (up from 6.5 inches) and a 12-speaker, 360-watt Harmon Kardon sound system – items that even the Cooper S E doesn’t come with. There’s a head-up display as well. 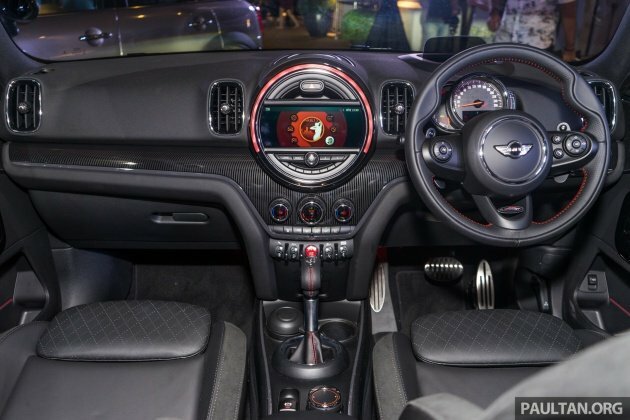 As before, there’s Carbon Black Cross Punch leather upholstery, a JCW steering wheel with paddle shifters, a chrome line interior and illuminated MINI Yours Piano Black trim. Standard kit includes LED headlights and fog lights, keyless entry, dual-zone climate control, cruise control and auto lights and wipers. Also fitted are auto-dimming mirrors, powered sports seats with driver’s side memory, Park Assist, Attentive Assist, the MINI Excitement package, a reverse camera, a powered tailgate with handsfree opening and MINI FindMate Bluetooth locator tags for your belongings. Passive sports suspension is fitted underneath. Power continues to come from a 2.0 litre turbocharged petrol engine producing 192 hp from 5,000 to 6,000 rpm and 280 Nm of torque between 1,350 and 4,600 rpm. There’s an eight-speed automatic transmission sending drive to the front wheels, enabling a zero-to-100 km/h sprint time of 7.4 seconds, a top speed of 224 km/h and combined fuel consumption of 6.1 litres per 100 km. Pretty extensive kit list especially the inclusion of the HUD, and HK sound system, something even the 530e doesn’t even get! Well firstly the number of service centers that Mini has in Malaysia is way more than Volvo for starts. I doubt Volvo’s XC40 ride and handling can match Minis too. But I have to say the look of the XC40 is really special. If you want to get an Audi TT, refer again to the first point about Volvo. this is a practical 4 door and 4 seater car with a decent boot. audi tt is far smaller. Sunroof? If doesn’t have, can add? Is this the newest version because I saw a comment saying in the newest model the mode shifter is no longer at the bottom of the gear shifter but at one of the 5 Center toggles. From the picture I see that it is, beside this, anything else changed? Will there be a facelift version coming soon with the Britain flag design of the rear light and simpler MINI new logo? Since this is dual zone AC. which zone does the rear AC vent gets?